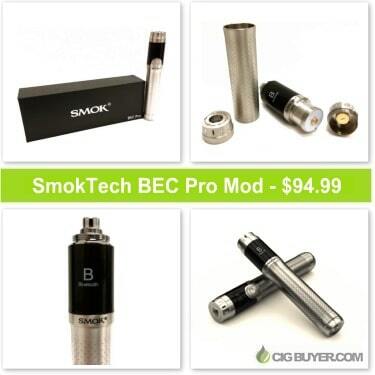 The SmokTech BEC Pro Mod is a heavily anticipated, next generation e-cigarette mod from SmokTech. Besides being variable wattage (6-50 watts) and variable voltage (4-12 volts), it also has a “Mech Mode” feature that will fire the device at your battery’s natural voltage. In addition, the BEC Pro Mod is also Bluetooth enabled! Install the free Apple or Google Android app to control the device via your cell phone and collect data about your daily vaping habits, including average puff time, number of puffs per day and more. * Expiration of this 5% OFF MadVapes deal is unknown and supplies are limited.